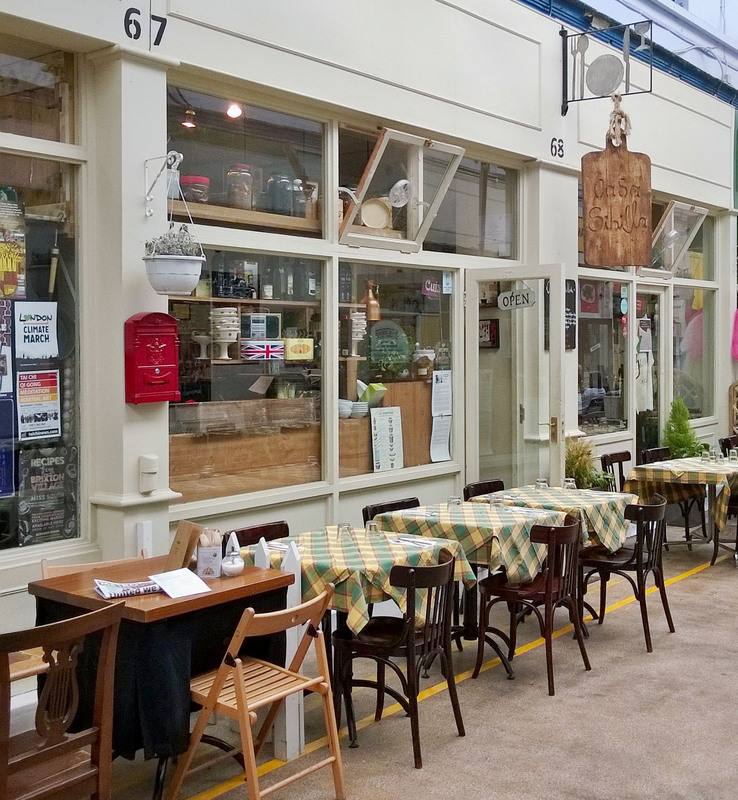 Casa Sibilla is an authentic Italian restaurant in the heart of Brixton Village. The market used to be full of sharks and fish of varying colours with vegetables that had to be boiled for days and then still seemed uncooked. It now has Italian restaurants – not only Italian but which actually say they serve food from particular areas of Italy. Casa Sibilla serves us food from Puglia and Piedmont. 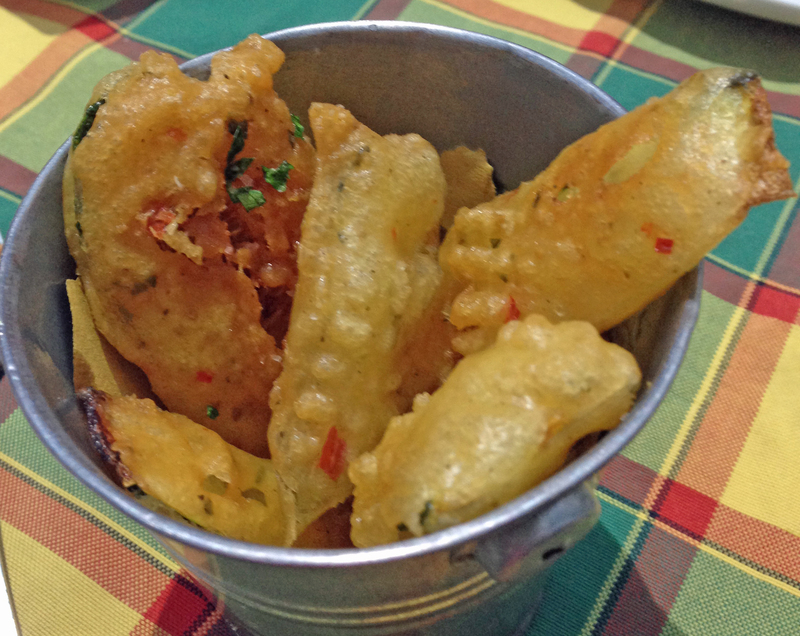 We have visited on and off but had not reviewed it for some time – so here goes. We booked – yes booked – on Opentable. This is certainly more organised than they were – or anyone is – in Brixton Village. This is determinedly Italian – short menu, speciality cocktail with others on the list – this year’s inevitable Aperol Spritz (prosecco and Aperol – refreshing and surprisingly alcoholic). It is in the heart of the Village and we highly recommend choosing an outside table in the wide and lofty passageway. It is the one lit by bizarre lights (different lampshades all put together to provide a souk-like atmosphere) which is in all the pictures of Brixton Village. Our Friday night started with alcohol – Aperol Spritz and a couple of other cocktails. We then hit the menu with the small plates for starters and the sharing plate of mozzarella, tomatoes, roast vegetables, pickled vegetables and various salamis. Bread is an extra and comes with three dips. The range of starters is impressive- 29 when we went but they do change. 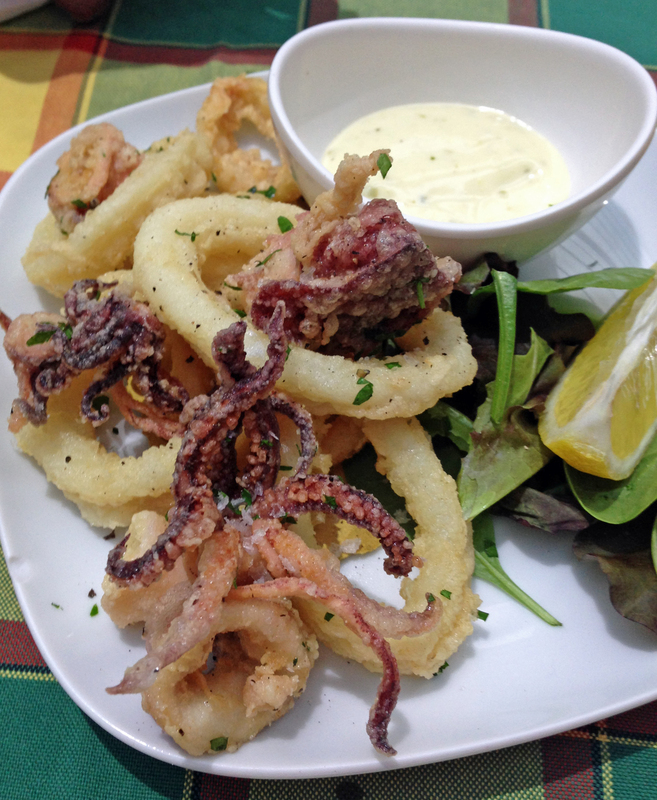 We chose zucchini fritti (little flowers in light batter), parmigiana (a little tower of aubergine, tomato and parmesan), salt and pepper calamari (with a light very garlicky aoli) and roasted vegetables. 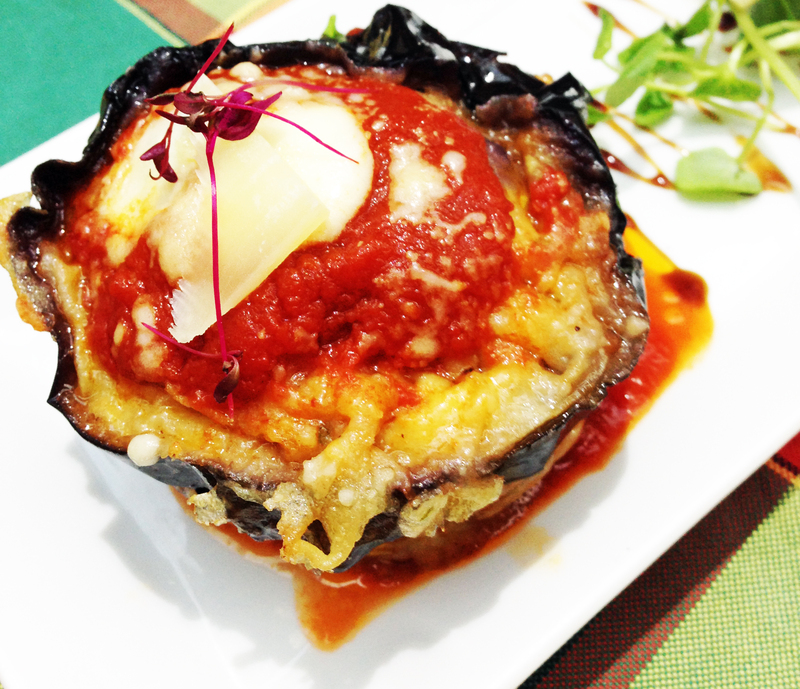 The parmigiana was as good as any we have had in Italy, soft aubergine and their tomato sauce is strong and acidic. The sharing plate was a bit of a disappointment following the small plates but the mozzarella (which I usually find rubbery and lacking any flavour) was softer than usual and a foil for the pesto topping. Although we were full we wanted to stay longer with the company, so we ordered a couple of starters to share – the ricotta and spinach ravioli and the duck leg confit. The ravioli was soft and really tasty and again came with their delicious tomato sauce and rocket. The duck comes with rosemary and garlic potatoes, vegetables and pesto. The potatoes were great but the duck skin could have been a bit crispier. Both plates were completely empty at the end. Again we could have held back but …. in for a penny ….. we went for dessert – a sweet treat followed by coffee and another couple of drinks. 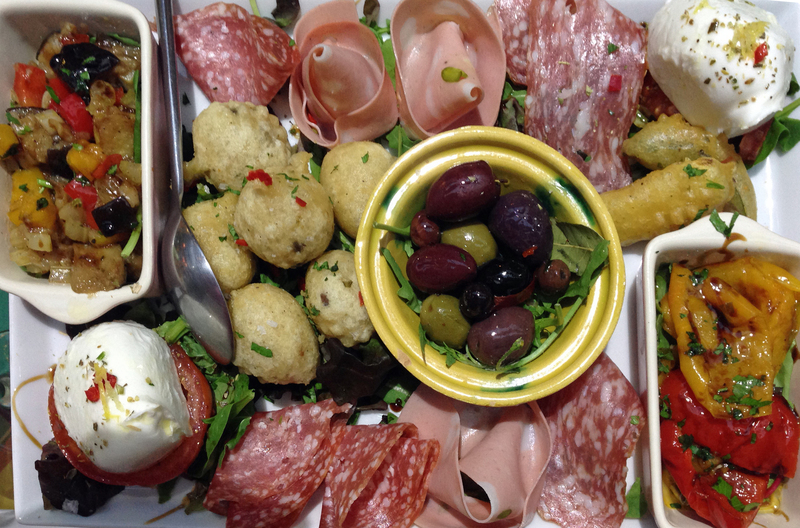 We washed all this down with a couple of bottles of Puglian wine – a primitivo. This is a dark skinned grape grown in Puglia and it is high in alcohol and tannin and very dark red. The grapes are called Zinfandel in the USA. Much of the wine in Puglia was put into Italian wines from the north but it is now making a play for more recognition under its own name. This was a good one – everything it promised and drinking it over a lengthy meal didn’t make us too drunk. The four of us sat down at 7.30pm on a Friday and had a leisurely meal – something which is usuall hard hard to do in the Village. Most restaurants are mainly fast food and rely on at least two or three covers a night per table, as they are all so small. But Casa Sibilla was spread out across the alleyway as well as having seats inside and so was much more accommodating, never asking us if we needed the bill. We left about 10.00pm so if you want a more leisurely (but more expensive) meal this is the place to go. They support NHS staff with a discount – I wish I had known as the bill came to £157.00 and change for four of us (but a large proportion – £70 at least was on alcohol including the cocktails). Please note they only take cash.